Home » OTHER Manufacturers » FH Butter Pat – Dudson Brothers Ltd.
Oh, I wanted this to be made by the Fred Harvey Company with those tantalizing FH initials and the Southwestern rust/brick red and mustard gold colors, but no. 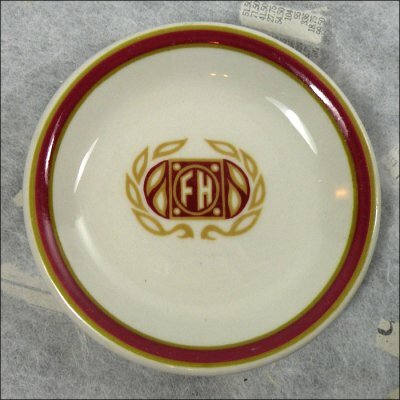 It might have been used by FH Hotels in Europe as there is a similarity in design between the two logos. This will be a mystery for the buyer to ponder.